Sushma tried to speak. Dadi bua said once Viplav got well, she had to leave. Viplav said she would not go anywhere. He said when Kamini could do aarti being a guest, then why she couldn’t stay there. Dhaani asked him to wait for one more day until Shalu’s pagphera rasam happened. Shalu said that must be costly. Dhaani came and brought a sandbox. She asked them to keep their foot on the sand. Dhani said it was from Viplav’s side. They obliged. He asked her to make that. Dadi Bua praised Kamini and Viplav’s choice. Dadi bua told one bidaai was remaining and asked the nurse to come. Dhaani and Viplav got shocked. Dadi bua put tilak on Dhaani’s forehead and thanked her for taking care of her son Viplav. Dadi bua asked Dasharath to make Dhaani understand. Viplav asked Dadi bua to listen to him. Dadi bua asked him not to interfere and asked Dhaani to go from there. 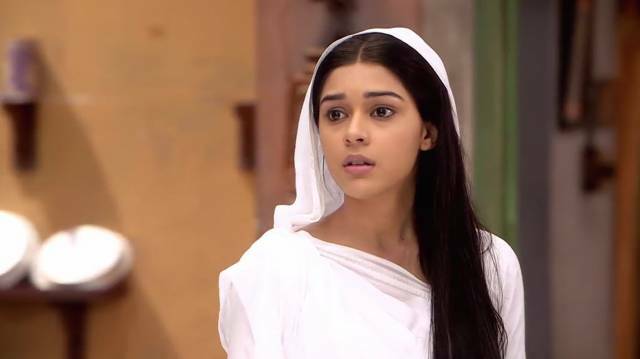 Viplav said Dhaani would not go anywhere. Dadi bua reminded Dasharath of her contribution and favors towards making him mahant. She said either her husband should come and take her or she should leave. Dasharath asked how she could go in a day. Dadi bua said her words were lines on the stones. Viplav told Dasharath that if his wife were thrown out of the house, then he would lose his respect and also his grandson. He said he couldn’t bear anymore and would tell everything to Dadi Bua. Dhani said she had no complaints with him. Viplav said he had. Dasharath came there. Viplav showed her hand and said was because of his lie. Dasharath apologized to his Choti Bahu. He said he has made that mistake and should be punished. Dasharath said he would tell the truth in one hour else Viplav could do whatever he wanted. Viplav nodded. Dasharath looked their expressions.